Perfect Shape is the shape management interface integrated with Perfect Cut. Provides features which reduce used time during the realizing of shapes thanks to helps that you can active with few clicks. Avoid using external CAD softwares to apply simple machining such as holes, buttonholes, notch, smooths and connectors. The application of grinding, also differentiated on each side, and the definition of the low-e edging area are simple and fast. Correspondence of parametric shapes with text format files, with metalanguage orientated to geometry. Possibility from Customer to use metalanguage to modify existing shapes or to create new ones. 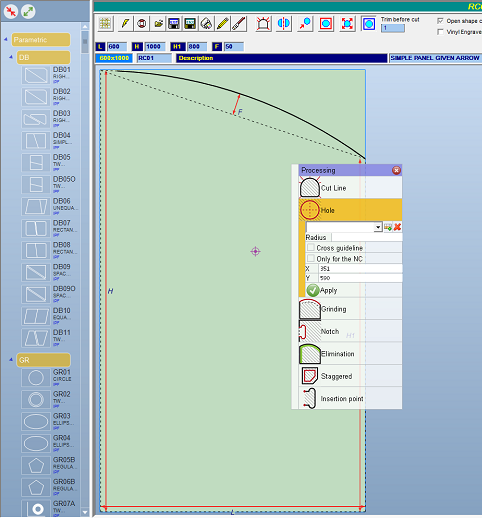 Tree view corresponding to directory where parametric shapes are saved; the first level are categories, final nodes are shapes. Possibility to use “methods”(specularity, offset for grinding, border, advance on border, scale factor). Possibility to receive by email or in another way new shapes and automatically inserting it in the bundle. Possibility to send the parametric shape directly to cutting postprocessor. Possibility to save the shape in owner format or in DXF format. Possibility to recall a CAD (configurable) for next changes on shapes. Holes with radius definition of the center insertion point, with the definition if the circle it’s cutting board or not, if make or not the incision of cross guide lines. Grindings with the definition of over materials, also for a consecutive entity sequence. Connectors with the definition of connector radius. Notch, grips with the insertion of the selected associated file. Staggered of the second component compared to the first one. It’s inserted a hole in order to make the incisions only of the cross guide line. In this way the operator knows where to make the hole with the drill. It is present the “mini-nesting” functionality which is the possibility to optimize shapes such as triangles and trapezoid or usually draws that could be easly matched with simples piece rotations. It is possible to open Perfect Shape from Perfect GEA management software. In this way it can be attached planning draws for shapes, staggered (shaped or straights) and grids. Usually it’s not possible to handle shapes in case of laminated materials. The Intermac numerical control allows it with some restriction (the shape muse be closed, it must respect some dimension restriction, etc.). Often the shape must be “tranformated” to be cut, for example with the addition of an empty part that allows at the machine to make the cutting necessary movements. The transformation happening at the insertion act of the shape or at the import. In case of transformation not allowed, the shape will be coloured with a different color and it won’t be cut on the numerical control. It is also possible to manage a single cut in diagonal.